Experience a whole new level of predator calling with the FUSION from FOXPRO. 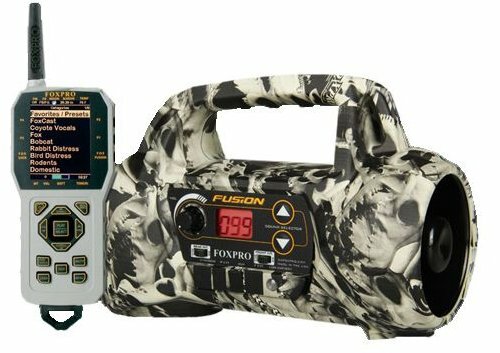 The FUSION comes with 100 high quality FOXPRO sounds and can store and access up to 1000 sounds. The FUSION features dual amplified speakers to deliver incredible volume. The front horn speaker handles your coyote vocalizations and common distress sounds with ease. The rear cone speaker handles the low frequency sounds such as bear growls, owl sounds and even mountain lion sounds. When combined they deliver a crisp, clear, high quality and realistic sound. If you want even more volume, the FUSION allows you to connect two external speakers for incredible volume capabilities, has a charge jack, and auxiliary jack to connect an approved device such as a FoxJack decoy. You can operate the FUSION manually or with the TX-1000 remote control. The TX-1000 features a full color graphic LCD screen which displays your sound list or sound categories. It also has a barometer indicator, moon phase indicator, temperature indicator, battery level indicator, timer or time clock, FOXBANG technology and much more. FOXMotion allows you to fade the sound from the left speakers to the right speakers to help “sell” the reality of your call sounds. FOXFusion allows you to mix and match any two sounds at the same time during your calling sequence. FOXPitch allows you to manipulate the “pitch” of the sound in an effort to trigger a response. FOXData allows you to record real time information from each and every stand so you can access the data for future reference. The FUSION is available in FOXPRO Skull Camo and is backed by a 5 year limited warranty and FOXPRO's unmatched customer support and is proudly made in the USA. If you have any questions about this product by FOXPRO, contact us by completing and submitting the form below. If you are looking for a specif part number, please include it with your message.